An experimental design study was conducted, exploring altered states of consciousness to facilitate psi by using binaural beats within a Ganzfeld free response ESP test. Certain brain frequencies have been associated with different states of consciousness. Theta waves (4–7Hz) have been linked with deep meditation; alpha waves (7–13Hz) with hypnagogic/hypnopompic states and dreams; and beta waves (13–39Hz) with active, busy thinking, Teplan (2002). This study examined if three different binaural beat frequencies (6Hz, 10Hz and 18Hz) replacing the audio stimuli in a Ganzfeld produced could influence and enhance psi performance, with long waves (theta and alpha) having a greater effect then short waves (beta). A sample of 36 participants was recruited, with each participating as a Ganzfeld receiver and sender. ​At the end of being a Ganzfeld receiver each participant was asked to place four video clips (one target, three decoys) in rank order (1 best fit to 4 worst fit) based on any experiences they had during the test. These rankings provided two sets of data (direct hits – where the participant placed the target video in rank 1, and binary hits - where the participant placed the target video into either rank 1 or 2). This data was analysed using Rosenthal and Rubin (1992) Pi effect size estimator and associated z-contrasting diffuse and focused tests. The results showed no linear increase from short waves to long waves (beta, alpha, theta), in ESP effect for direct hits Z = 0.529, p = 0.302, there was no significant difference. However they did show a significant difference for binary hits Z = 2.121, p<0.05; providing evidence for a linear increase in ESP effect. The theta condition in both sets produced a pi effect size over mean chance expectation of 0.500 (direct 0.600, binary 0.667). A qualitative analysis was conducted on the theta condition, which was transcribed and analysed to explore any thematic properties. This showed that the binary group expressed 54% more verbal statements then the direct group, suggesting that the increase in mental imaging might be overloading or diluting the target signal. Also the binary group focused more on mental images (simple and complex), whereas the direct group focused on physical sensations and feeling. Further research into target perception, (target visualised or sent as a mental image or as a physical feeling). This study has provided evidence that theta (6Hz) binaural beats as an inducer for an altered state of consciousness can increase the hit rate in a Ganzfeld test, and that long waves can have an impact of on psi performance. Further research on the effects on long waves and the validation of audio frequency-following response activity, by way of an electroencephalogram study on psi performance is needed, to both increase our knowledge on the workings of the human brain and to explore the roles that psi plays within it. 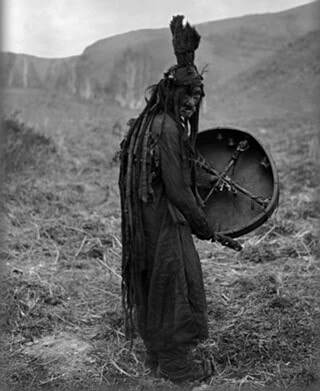 Exploring altered states of consciousness (ASC), Van de Castle (1974), purposed that it may be one of the reasons why, along with a strong cultural and belief system, that non-western societies show an increase in paranormal phenomena (Psi) such as; Extrasensory Perception (ESP) and Psycho-kinesis (PK) than western societies. And that this may be due to western cultural prohibitions against ASC, which could limit psi function. ​Although the debate concerning Psi phenomena (being weak, rare and unreliable) still echoes down the halls of the scientific community (Kennedy, 2001), one view of psi it that it is a weak signal that is embedded within other cognitive activities (Bem and Honorton, 1994), and that psi performance could be enhanced under certain conditions. On exploring this, Tart (1978) suggested that one type of condition that may improve psi functioning would be the use of ASC. As ordinary, active brain processes and sensory ‘noise’ could drown out the weak psi signal, and that a strong correlation between enhancing psi functions and less control of ordinary brain processes could be due to the decrease in resistances to psi impressions. One such technique to try and dampen down sensory ‘noise’ in an attempt to gain access to the psi signal is the use of the Ganzfeld procedure, first used by experimental psychologists in the 1930s and parapsychologists in 1970s (Honorton, 1977). The Ganzfeld is used to create a sensory homogenous field by temporarily reducing visual and auditory stimuli, and thus in turn reducing sensory ‘noise’ to the brain. 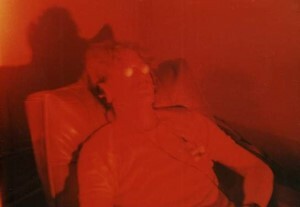 When applied to psi research in free-response ESP tests; an individual is comfortably seated in a room filled with red light, with their eyes covered by a semi-transparent guard and wearing headphones playing white or pink noise. They are asked to verbally state anything that comes to mind, which is recorded. At the same time a second individual in a separate location is trying to mentally send a signal (target image) to them. Since the 1970s and the first series of Ganzfeld experiments more research on target type has been studied, for example comparing static targets of still pictures vs. dynamic targets (video clips). ​Results found that the multiple image targets of videos obtained a significantly higher hit rate then single-image targets (Ben and Honorton, 1994). This could be due to the richness and multiple sensory stimulation of the video (visual and auditory) to that of the flat visual image of a picture. Research using the Ganzfeld procedure has found that like many other altered state of consciousness (e.g. dreams, meditation, and hypnosis, ) it may be psi-conducive, due to the techniques ability to diminishing rational censoring of mental imagery, Bem (1996). 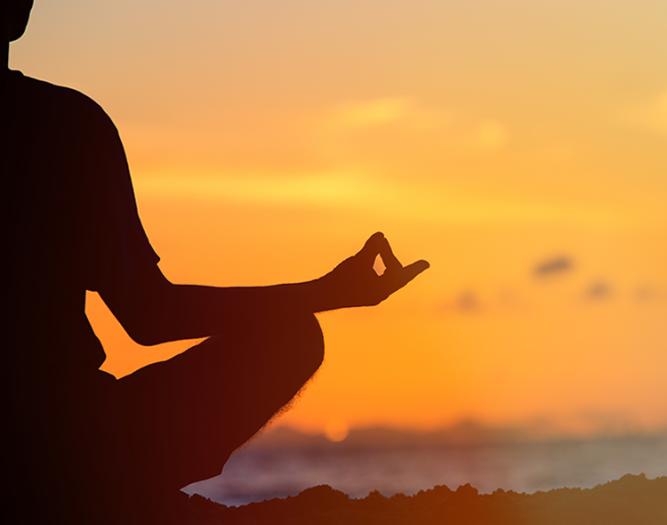 A second method already being used by a growing number of meditators to try and still their minds of sensory ‘noise’ is the use of binaural beats. This auditory delivered technique consists of two slightly different toned frequencies being presented separately into the participant’s ears using stereo headphones (e.g. one tone at 300Hz played in the right ear and one tone at 310Hz played in the left ear). From this dual tone, a third signal (the frequency between the beats) is processed by the brain (10Hz), although to the user it sounds as if the two tones mix naturally. This is due to perceived human hearing being limited to the range frequencies of 20 Hz to 20,000 Hz. 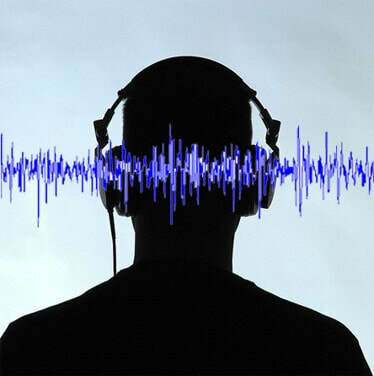 Research also suggests that there may be an abundant range of binaural beats found in the external world by way of mechanical devices, Oster (1973). For example, the engines of a plane or train. Research exploring different beat frequencies and their impact on brain function has found that they can influence brainwave patterns by changing brainwave frequency to match the dual tone frequency; this is called a ‘frequency-following response’, (e.g. Using an electroencephalogram (EEG), an 24Hz audio stimulus would result in a measured 24Hz frequency-following response) (Smith, Marsh and Brown, 1975). When exploring brainwaves and their related states of consciousness, research has found that many functions associated with consciousness are closely regulated by the brain’s reticular formation, stimulating the thalamus and cortex (an extended reticular-thalamic activation system) (Newman, 1997). It is this system that controls levels of arousal and attentiveness in our response and reaction to information from the reticular activating system (RAS), which interprets data from both external sensory data (e.g. levels of awareness) and internal stimuli (E.g. attitudes and feelings) (Empson 1986; Tice and Steinberg 1989). The use of binaural beats and their ability to produce a frequency-following response prompts changes in EEG patterns throughout the cortex, which can allow users to access different states of consciousness relating to different beat frequencies. (Atwater, 1997). Research into physiological markers for psi experiences has also been steadily increasing. Sartori, Massacessi, Martinelli, and Tressoldi (2004) explored the differences in heart rates in two force choice ESP tests. Participants were shown four calm picture cards and asked to select the target picture, while their heart rates were monitored. (One tested for pre-cognition, where the target picture would be selected after the participant’s choice, and one tested for ESP, where the target had been selected before the participants choice). Results from this study found a statistically significant level in both experiments, leading to evidence that suggests that ESP information could be detected at a neurological level. A study by McDonough, Don, and Warren (2002) examining indicators of ESP by measuring event-related brain potentials while engaged in a card-guessing task found a significant difference in slow waved stimulus (theta band) and target hits. Alexander, Persinger, Roll and Webster (1998) collected neurological data using EEG and SPECT measurements while the participants engaged in psi tasks (psychic readings, card-guessing and remote viewing trials). ​They found that alpha waves (strongest in the right parietal lobe) were more dominant during the tasks. Although the psi tasks were all visual, and this may have attributed to the increased activation in the parietal cortex, it was the reports of spontaneous images entering the participant’s minds during the task when their eyes were closed that suggests that there could be a neurophysiological correlation. Whereas McDonough, Don & Warren (1989) using EEG data and a clairvoyance card-guessing task indicted a high hit rate within the theta bands over right cerebral hemisphere. By examining brain wave activities and patterns, Persinger (2001) suggests that there may be a specific area or pattern that could be associated with paranormal experiences, as individuals who display complex partial seizures (particularly the hippocampus and amygdale regions) report higher paranormal like experiences. With paranormal experiences being reported while under direct surgical stimulation of structures within the right temporal lobe (mesiobasal), and participants who report more types of paranormal experience tend to show more prominent alpha rhythms over the temporal lobes. Exploring certain brainwave frequencies have shown to be associated with many different ASC. Theta waves (4–7Hz) have been linked with deep meditation/relaxation and NREM sleep (non-rapid eye movement sleep), alpha waves (7–13Hz) with relaxation, hypnagogic/ hypnopompic states and dreams. And beta waves (13–39Hz) linked with active, busy or anxious thinking and active concentration, Teplan, (2002). As mental states relating to theta and alpha waves frequencies show a large correlation with altered states of consciousness and facilitate psi (e.g. Ganzfeld procedures, mediation, out of body experiences (OBE), near death experiences (NDE) and alien abduction experiences (AAE), could the exposure to these frequencies increase psi performance? Studies using photic stimulation pulses (the visual alternative to binaural beats) at different frequencies found that the technique could induce altered states of consciousness (Glickson, 1986), and that long waves (6Hz & 10Hz) could produce complex mental imagery. One study conducted by Richard and McAndrew, (1990), used photic stimulation pulses at various frequencies to induce altered state of consciousness and mental imagery. This study was able to establish that on average more complex imagery was reported at the 6 Hz and then the 10Hz frequencies (theta and alpha wave bands), and that light waves similar to audio waves could influence mental processes. This study examines if binaural beats can induce alternate states of consciousness to facilitate Psi. Using a Ganzfeld free response ESP procedure, but instead of using white or pink noise as the audio stimuli, the use of binaural beat tones tested at different frequencies associated with different ASC (6Hz, 10Hz and 18Hz) will be employed. That binaural beats as a facilitator for inducing different altered states of consciousness can effect psi performance. That long wave binaural beats in the theta and alpha frequency range will have a greater effect on psi performance than short wave binaural beats in the beta frequency range. That binaural beats in the theta frequency range will have a greater effect on psi performance than binaural beats in the alpha frequency range. This study used an experimental design, examining the effects of different altered states of consciousness induced by audio frequency stimuli on psi performance. Using a Ganzfeld procedure where the participants target selection is the measured dependent variable, and the three different binaural beat conditions (theta 6Hz, alpha 10Hz and beta 18Hz), along with the control pink noise condition, are the independent variables. Opportune sampling of 36 participants, all UK citizens between the ages of twenty one and fifty- years-old were recruited by invitational e-mails to work colleagues and associates. Each participant took part in both conditions (as a Ganzfeld Receiver and as a Ganzfeld Sender). To avoid sequencing effects, each participant was first selected as a Receiver and then a Sender (with the exception of the first study where a volunteer Sender did not participate as a Receiver). One volunteer assistant was also recruited and assigned to the target selection process in order to avoid sensory leakage from target to researcher. No agreements or payments for taking part in this experiment were offered to any participants. Ethical guidelines were adhered to and participant rights were outlined to those taking part. These included clearly stating that participants could withdraw from the experiment at any time, explained issues around confidentiality, and their right to have their personal data destroyed if requested. To create the Ganzfeld effect for the Receiver, one white semi-transparent ping pong ball was cut in half and placed inside a standard clear swimming goggle, (making sure that all of the eye section was covered). These were used as the Receivers eye guards to decrease visual stimuli. 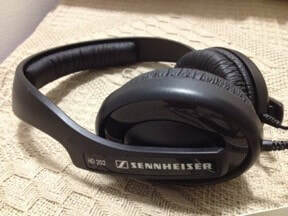 One Sennheiser HD 202 closed headphone was used to both decrease external auditory stimuli and to deliver the experiment instructions and the condition track. 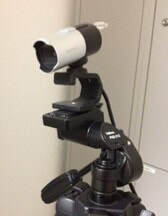 One Microsoft webcam using Microsoft LifeCam software was set up on a tripod for the visual observation and safety of the Receiver while in the experiment. 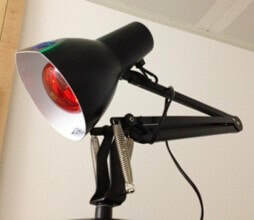 One lamp equipped with a 60w (220-240v) red light bulb was used to create a homogeneous perceptual environment and one Olympus WS-550m digital voice recorder with USB facilities was used to record any verbal statements that the Receiver might express throughout the experiment. A five meter USB 2.0 active extension cable and an audio extension cable was used to link the Receiver’s headphones and the webcam to the researcher’s laptop, where the condition tracks were controlled. 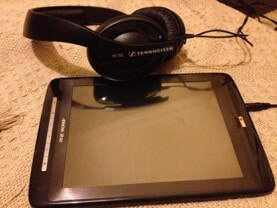 For the Sender, one 8GB ARCHOS Arnova 8 G2 Tablet PC equipped with one Sennheiser HD 202 closed headphone was used as the devise to deliver the target video and decrease external audio stimuli. (Paper instruction on the use of tablet was also provided). 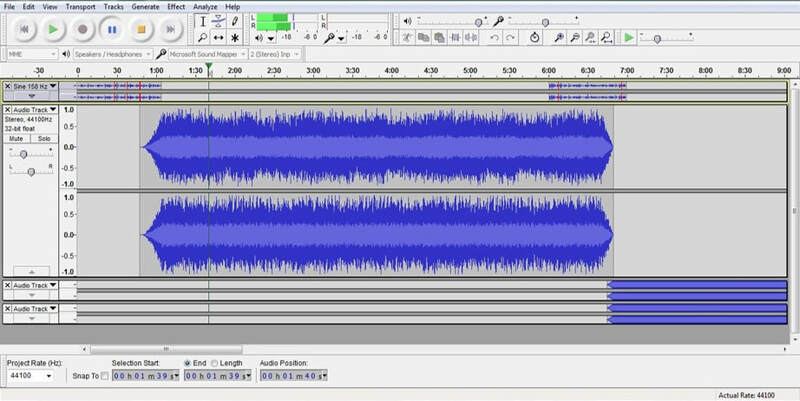 Four, thirty-minute binaural beat tracks were created using a free digital audio editing and recording application called Audacity 1.3 Beta (Unicode) for use on Window 7. Each binaural beat sine wave (two per condition; left and right side) had a project rate of 44100Hz, a sample format at 32 bit float and was set at -12db. The theta condition track (6Hz) was generated with the left sine wave at 152Hz and the right sine wave at 158Hz. The alpha condition track (10Hz) was generated with the left sine wave at 152Hz and the right sine wave at 162Hz. The beta condition track (18Hz) was generated with the left sine wave at 152Hz and the right sine wave at 170Hz. For the control condition track pink noise (random frequencies having equal energy per octave) was generated. Each condition track had a one-minute recorded introduction that thanked the participant for taking part, gave instructions of how to adjust the headphone and eye goggles (for comfort), asked them to keep their eyes open and also informed the Receiver that if at any time they would like to stop the experiment they should raise their hand. The recording asks the participant to try and relax and let their mind wander at which point five-minutes of relaxing music (Music for Relaxation Forget Insomnia mp3, 2009) is faded in. At the end of the music there is a one-minute recording that instructs the participant to observe their thoughts and try to verbally explain what they are feeling and any images coming to mind, and to continue doing so until asked to stop. At this point the selected thirty- minute binaural beat track is faded in. At the end of the track a one-minute recording overlaid with the relaxing music is played to inform the participant of the end of the experiment and thanks them for taking part, the relaxing music continues for a further one- minute. Each condition track last for thirty-eight minutes in total. A library database of thirty-six, half an hour videos was created using five-minute video clips (all sourced from publicly available internet websites) looped six times using windows movie maker. The clips were selected using four different themed criteria, nine videos for each theme; film, skill, nature and sport. Nine video packs were created (A to I) all including one video from each theme. The database was held on two computers (the researcher’s laptop and the volunteer assistant’s computer). Two separate locations were used for both Receiver and Sender, within the same building approximately fifteen meters apart. The closed headphones used were designed with pads that enclosed the ear fully so sound waves are greatly reduced from travelling in and out of the headphones, creating an external sound reduction environment. The researcher’s location was set between the two locations and was also equipped with one Sennheiser HD 202 closed headphone to monitor the condition tracks. Two Excel random number generators were created using Microsoft Visual Basic for Application command; Randomize (Rnd+). One was used to randomly select the video pack for the experiment and the second to select the target video from that pack (one target video, three decoys videos). Both number generators were located on the volunteer assistant’s computer. Before the experiment began the volunteer assistant would use the random number generator to select the video pack and the target video. Once done they would download the target video onto the Sender’s tablet and place it in the Sender’s room. They would also inform the researcher (via mobile text message) of the selected video pack but not the target video. The researcher would have the webcam active on the laptop screen and have the condition track ready to play. The Sender would be instructed to go directly to the Sender’s room and wait by the volunteer assistant, while the Receiver would be welcomed by the researcher and guided to the Ganzfeld Receiver room. There, the researcher would thank them for taking part, go through the participant information sheet and ask, if still willing to take part, to sign a consent form. With this done the Receiver would be asked to make themselves comfortable on the reclining bench, put the headphones and eye goggles on, and wait for instructions (via the headphones). The researcher would put the red lamp and the voice recorder on, switch off the main light and exit the room. The researcher would put on their headphones, start the condition track, and observe the Receiver. Once the relaxation music had ended the researcher would walk to the Sender’s room and knock on the door three times (this being the signal for the Sender to put on the headphone and start the video file on the tablet). The researcher would return to their laptop and continue to monitor the Receiver. Once the condition track had ended the researcher would enter the Receiver’s room, switch on the main light and switch off the red lamp. The researcher would show the Receiver five minutes of all four videos from the selected pack and ask them to rank the video’s (one being the best fit and four being the worst fit) to what they feel they experienced while they were wearing the headphones. (Video viewing sequence staggered per experiment; e.g. starting with video one and ending with video four, and then next experiment starts with video two ending with video one etc…). Once their rank has been recorded by the researcher, the Receiver would be debriefed and asked if they had any questions. On completion of this the researcher would inform the Receiver of the next stage of the experiment; being a Sender, details concerning use of the tablet, the three knock start signal and would ask them to try and immerse themself in the video clip and send it to the Receiver. 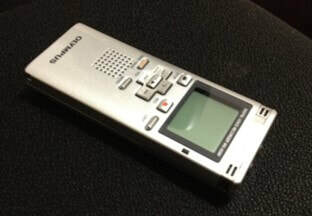 With this understood the researcher would download the voice recorder data onto the laptop, the volunteer assistant would record the target video, and the experiment would be reset with the next Receiver. Participants were asked not to communicate with each other (e.g. about their experiences or the videos) while taking part in the study. After all thirty-six participants data had been collected direct hit rates (rank 1) and binary hit rates (rank 1 & 2) were analysed using Rosenthal and Rubin (1992) Pi effect size estimator and associated z-contrasting diffuse and focused tests. Also the Receiver’s recordings were transcribed by the researcher and a qualitative analysis using Myers and Murphy (1962) measurement of image complexity was conducted to explore any thematic properties. Table 1 shows the number of targets for each condition and the theme categories they were selected from, using a random number generator. A chi-square test of equiprobability for theme selection was performed that showed X² (₂) = 0.905, p = 0.636. This shows that there is no significant difference between the four themed target selections (homogeneity). Two sets of results were generated from this study. The first set looked at the number of direct target hits, where the Receiver placed the target video into rank 1 (best fit). Table 2 shows that the control, beta and alpha conditions all scored 2 direct hits each; this generated a hit rate of 0.222 and a π effect size of 0.462. The theta condition scored 3 direct hits generating a hit rate of 0.333 and a π effect size of 0.600, (above mean chance expectation (MCE) of 0.50). To test for statistical significance of the heterogeneity of the condition’s π effect size, a chi-square test was performed that showed X² (₂) = 0.456, p = 0.928. This shows that there is no significant difference between the conditions (homogeneity). Contrasting the effect sizes between theta, alpha and beta, a focus test was calculated on the basis that the effect was a simple linear increase in hit rate, from beta to alpha to theta. With this the contrast coefficients for the conditions were -1, 0, and +1 (beta, alpha and theta respectively). This showed Z = 0.529, p = 0.302. This shows that there is no significant difference between the effect sizes, suggesting no linear increase in ESP effect for direct hits. The second data set looked at the number of binary target hits, where the Receiver placed the target video into either rank 1 or rank 2. By combining rank 1 and 2 this reduces this number of choices (k) to 2 (hit or miss). Table 3 shows that the beta condition scored the lowest number of binary hits with 2, generating a hit rate of 0.222 and a π effect size of 0.222. The control and alpha conditions both scored 4 binary hits, generating a hit rate of 0.444 and a π effect size of 0.444. The theta condition scored the highest binary score of 6, generating a hit rate of 0.667 and a π effect size of 0.667, (above MCE of 0.50). A chi-square test was performed to test for statistical significance of heterogeneity. This calculated to X² (₂) = 4.531, p = 0.210. Not a significant difference; condition homogeneity. Using the same contrast coefficients of -1, 0, and +1 for beta, alpha and theta respectively for condition contrasting, this generated Z = 2.121, p<0.05, a significant result which demonstrates evidence for a linear increase in hit rate from beta, through alpha, to theta. In both data sets, the theta condition displays the highest hit rate and a pi effect size over mean chance expectation. This provides strong evidence for the theta binaural beat condition having a greater effect on psi performance then alpha or beta (Hypotheses 3) and that binaural beats as a facilitator for inducing different ASC can effect psi performance (Hypotheses 1). Although not above MCE, the alpha condition in the binary set did result in a hit rate that was double the beta condition and the linear increase in ESP effect, which provides evidence that long wave binaural beats can have a greater effect on psi performance than short wave binaural beats (Hypotheses 2). Due to the greater then MCE hitting rate of the theta condition and the linear increase effect found from the binary hits and not direct hits, a qualitative analysis of the Receiver’s statements made within the theta group was performed to explore any thematic properties that may cause this difference within the same group. 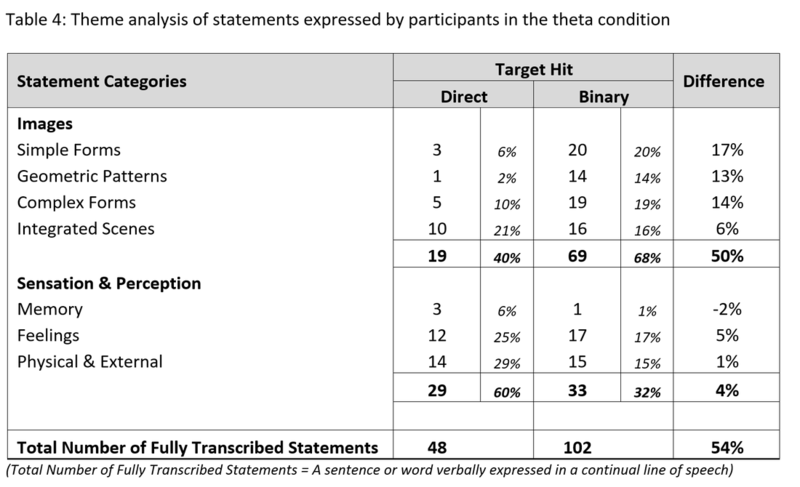 Binary participants show a 54% increase in the amount of statements verbally expressed to that of the direct participants. The largest increase is found in the Simple image forms (20%), which included; flashes of light, colour and smoke, followed by Complex image forms (19%), which included; Objects and Faces. Direct participants showed a 2% increase in expressing memories than that of Binary participants. The largest percentage of statements expressed within the direct groups falls into the Sensation and Perception category of Physical and External experiences (29%) followed by Feelings (25%), and Integrated scenes (21%). When examining the statements in the direct hit group for details relating to the target video, each of these categories shows a potential statement. 22 It does feel like I'm lying down, sort of, not in a grave but in something that sort of shape and I'm lying in it and the ground is above me and you can sort of just seeing over the side of it, so it doesn't feel very deep. Although the same categories for both groups show potential statements for the target video, the binary group still places the target into rank 2. A possible reason for this could be due to the large increase in thought information expressed by the binary group, suggesting that the greater volume of information mentally processed by the Receiver could lead to a diluting effect on the Senders signal, with the target video signal getting lost in all the mental noise. More research would be needed to see if this overloading of information would have an effect on Psi hitting. The results from this study show that the use of binaural beats to induce different altered states of consciousness based on the frequency of the dual tone can have an impact of psi hitting in a free response ESP test. Both data sets show a greater then mean chance expectation (0.50) pi effect size in the theta condition, and although between the groups in the direct data set this did not show a linear increase in ESP effect size from beta, alpha to theta, the binary group did. This supports that wave frequencies can influence psi hitting, where beta waves at 18Hz produce low hitting rates followed by alpha waves at 10Hz, and with theta waves at 6Hz, producing the highest hitting rate. Exploring the differences between the participants in the theta condition, who placed the target video into rank 2 instead of rank 1, this could be due to the amount of thought information that was processed and verbally expressed by the participants, (Binary group 54% increase to that of the direct group), and also the types of thoughts that the participant focuses on while in the experiment (metal imaging to physical and external experiences). This increase in verbal statement expression could show that the participants in the binary group are more inclined to generate mental images (mainly simple forms such as colours and complex forms such as objects) in order to fill their minds when in a homogenous field then that of the participants in the direct group. Also the main focus of the direct group was in the sensation and perception category, with the highest being physical and external statements (29%), whereas the binary group’s main focus was in the images category, with simple forms being the highest statement selection (20%). This difference in statement focus between the groups could also play a role in how the participant rank the target video, as the binary group may look for visual similarities between what they experienced during the experiment and what they believe the target video is, whereas the direct group may rely more on how the video makes them feel, and how this feeling might be similar to what they felt during the experiment. Further research into the roles of the target, its connection with the participant and how it might affect psi performance would help explore these aspects. From this study these results provide; support to past research that altered states of consciousness can be a facilitator for psi (Tart, 1978; Bem, 1996) and evidence that altered states of consciousness ranging in the long wave frequency spectrum can have a greater effect on psi performance (McDonough, Don and Warren, 2002) and generate complex images (Richard and McAndrew, 1990). 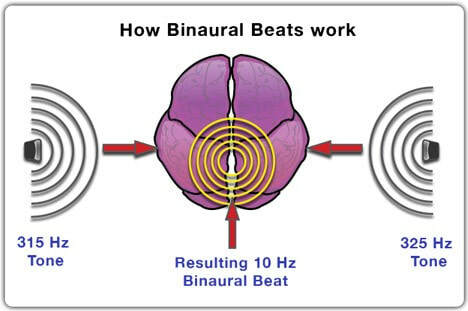 As for the use of binaural beats although this study cannot confirm that the beats produced a frequency-following response that effected the participant brain wave pattern to the selected frequency (due to lack of EEG measurements) this study can state that binaural beats can induce altered states of consciousness different from that of the waking state. That they can generate a higher hitting rate (theta condition) in a Ganzfeld free response ESP test than that of a Ganzfeld test using pink noise (generating a hit rate the same as the alpha condition). To avoid past criticism for lack of controls in Ganzfeld studies, certain procedures were put into place. To prevent sensory leakage, where the researcher may unconsciously help the participant select the correct target image (E.g. via body language, speech pitch or tone) a volunteer assistant was recruited to select the target and interact with the Sender. At no time throughout the study did the researcher have access to the random number generators for video pack and target selection, as this was located of the assistant’s computer and password protected. The assistant would only inform the researcher of the video pack that was to be used for that experiment and only after the experiment had been completed and the Receiver’s data recorded would the assistant reveal the target video. For video randomization relating to the order that the videos in the target pack were shown to the Receiver, this was staggered, as this would decrease the effect of any pre-existing match response biasness, where participants may be inclined to select the first video or the last video they view. Randomization of the target video was also used. In order to decrease the chances of participants being able to communicate with each during the experiment, both the Receiver and Sender were placed in different locations and their contact was minimised as each participant was welcomed and instructed separately, at separate times. As soundproofing was not available the use of closed headphones and room distance (fifteen metres) was used to decrease sound interference, although ideally separate buildings for the two rooms would have been favoured. Each room (without windows) was closed with only the Sender or Receiver present in it during the experiment. The Receiver was monitored by the researcher via the webcam and if the Sender required any assistance (E.g. tablet issues) this was directed to the volunteer assistant, (though none were noted). Initially the use of three external judges to independently judge the participants target choice was to be applied to this study. Each judge would have been randomly supplied with a participant’s transcript (the Receiver’s statements expressed during the experiment) and the corresponding video pack. They would have been asked to review the transcript and then from it, rank the four videos from 1 (best fit) to 4 (worst fit), twelve participants transcripts would have been given to each judge. This would have created a second set of data that would have been analysed for beat frequency to psi hitting. This approach was not used due to the time constraints of the study and recruitment issues. Ideally a second volunteer assistant would have also been recruited for this study and would have been assigned to Receiver interaction and briefing, leaving the researcher to control the wave conditions. As the researcher would have had no interaction with either the Sender or Receiver and each volunteer assistant would have been blinded to the experiment condition, this would have created a tighter control over sensory leakage and researcher effect. To develop this study, the use of an EEG machine to monitor any changes in brainwave patterns of the participants while being a Receiver would support the binaural beat claim of using frequency-following response to induce different altered states of consciousness. From this, long waves could be directly measured against psi performance. 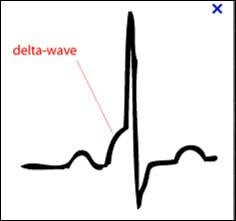 A second development for this study could be the introduction of a delta wave (4Hz) condition. As this study has shown a linear increase in ESP effect size from short wave to long, and as delta is the longest type of wave, this could show an even greater effect on psi hitting. A separate study could also analyse if there is any link between the target image and how the Sender and Receiver interpret it. It could explore if the target generates physical sensations or feeling within the Sender and Receiver or whether it is a visual, image experience. A second target focus study could look at the use of three dimensional targets, one that the Sender could hold and interact with. As results have shown that multiple images (videos) have been linked with higher psi hitting rates then single images (pictures), perhaps a more physical object would have a stronger effect. With more interest and research into the effects of altered states of consciousness, how they have an impact on brain function, and how these functions could affect psi performance this could provide support to the theory that psi might be a weak mental signal. And that trance, dream-like states of consciousness already associated with psi experiences and performance (Krippner, 1975; Graff, 2007) could show that conscious states within the long wave spectrum might be able to tune into this signal. As low wave frequencies can be found in the natural world (E.g. lightning strikes, disturbances in the Earth’s magnetic field) and from manmade objects (E.g. engines, power lines) these external frequencies could have a connection to reports of spontaneous psi experiences. This study has shown that an individual would only need to be exposed to low frequencies for just over thirty minutes in order for there to be an increase in experiencing psi phenomena. By accumulating research that can help demystify and de-label psi phenomena as unreliable, weak and rare and by gaining knowledge that can help pinpoint physiological markers and explore psychological experiences, this could allow, not only the opportunity to examine the potential and limitations of the human brain but also how it may interact directly with the external world. Braud , W. (2002). Psi-Favorable Conditions. In V.G. Rammohan (Ed. ), New Frontiers of Human Science: A Festschrift for K. Ramakrishna Rao. (pp. 95-118). Jefferson, NC and London: McFarland. Cognition and Personality, 6, #2, 167-182. Honorton, C. (1977) Psi and internal attention states. In B.B Wolman (Ed. ), Handbook of parapsychology. Pp. 435-472. New York: Van Nostrand Reinhold. McDonough, B., Don, N. and Warren, C. (1989) EEG frequency domain analysis during a clairvoyance task in a single-subject design: An exploratory study. In L. A. Henkel and R. E. Berger (Eds. ), Research in Parapsychology 1988 (pp. 38-40). Metuchen, N. J. The Scarecrow Press, Inc.
Oster , G. (1973). Auditory beats in the brain. Scientific American, 229, 94-102. Rosenthal, R. and Rubin, D. (1992). An Effect Size Estimator Parapsychological Research. European Journal of Parapsychology, Vol 9, 1-11. Smith, J.C., Marsh, J.T., and Brown, W.S. (1975) Far-field recorded frequency-following responses: Evidence for the locus of brainstem sources. Electroencephalography and Clinical Neurophysiology, 39, pp. 465-472. Villoldo, A. and Krippner, S. (1987). Healing states. New York: Simon & Schuster.